Battles. The art is sufficiently epic. That Loki is one mischievious fellow. No, not the Marvel villain, the trickster god from ancient Viking mythology. Now, he’s sending his armies to conquer Midgard, and only you and your fellow desperate warriors can band together to fend off the invading hordes and mythological creatures to save your world and prevent Ragnarok! Provided, of course, that Fate is on your side. This is Runecast, a game currently seeking funding on Kickstarter. Runequest is a fairly light, cooperative dice game in which you are attempting to defeat several waves of attacking forces powered by Loki. 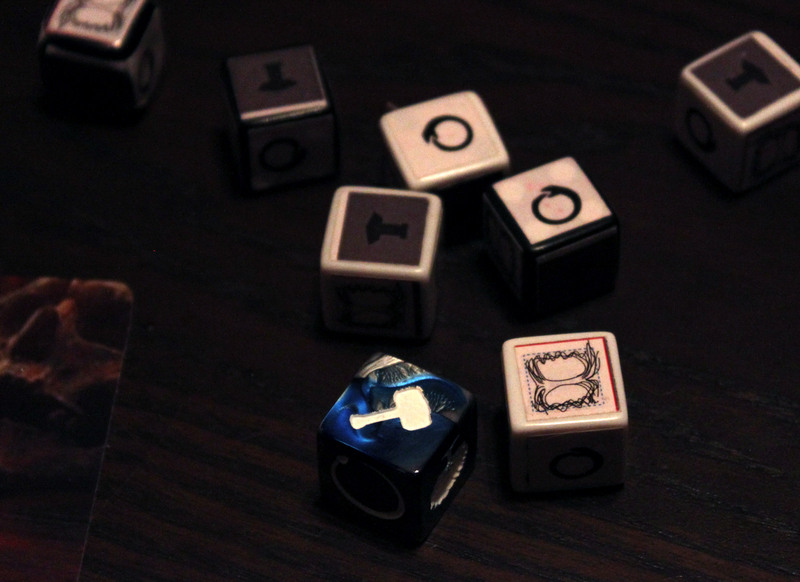 Each round, players will take a turn, and then Loki’s dice will be rolled. 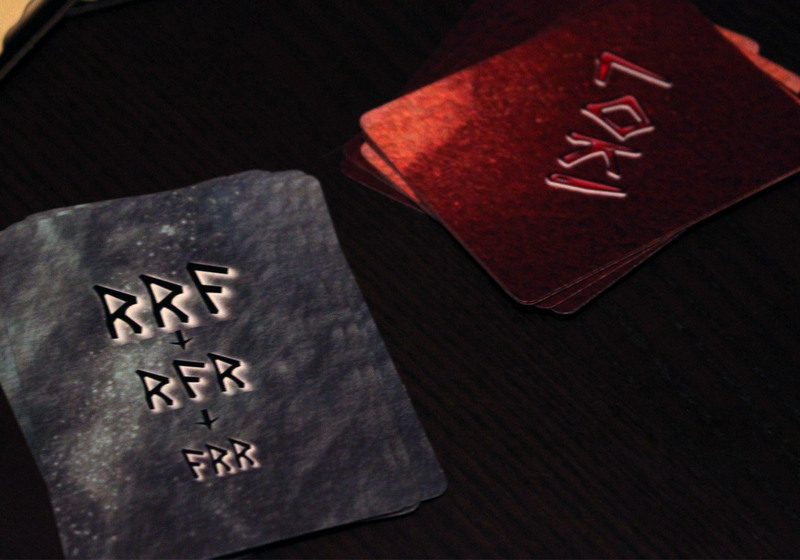 On a player’s turn, they can do 2 things; first, they have the option of drawing a Fate card from their personal deck, dealt at the start of the game. This deck contains mostly weapons and armor, but it also contains special cards that can provide a boost or a penalty; it’s up to fate to decide what happens. Even if it is a weapon or shield, a player can only have one of each – so if they draw a shield but already have one in play, they must lose their old shield and use the new one instead. Weapons and Armor also have a limited number of uses, and once they hit their break point they must be discarded. After the Fate draw, players roll dice. Each player has a dice pool, set from the start of the game based on the number of players, but somewhere around 6 to 8 dice. This pool can be modified by weapons, fate, and character abilities. Dice have Hammers, Trees, and Snakes on them, distributed evenly. Hammers, when rolled, deal damage. 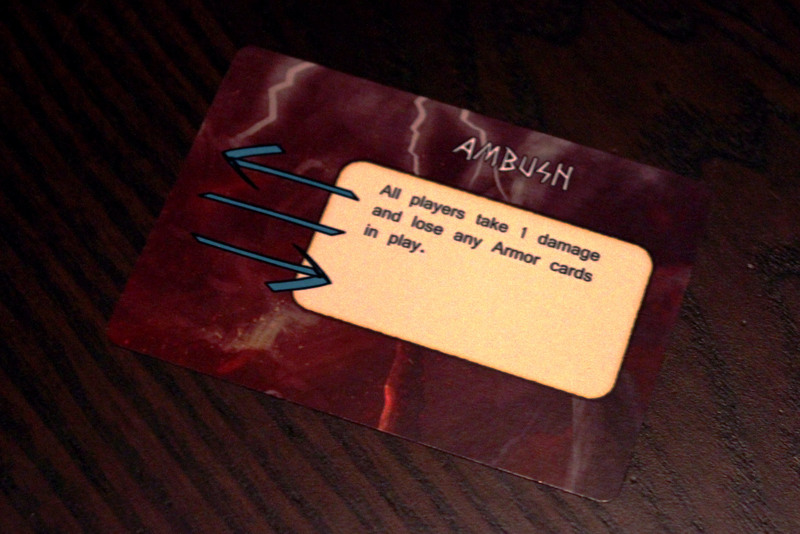 Trees can be used to heal hit points, but to do so the dice must be “locked” into one of two slots on your character card. Dice placed in these slots can’t be removed until the END of your next turn, and these dice count against your dice pool – so if your normal pool is 8 dice and you lock away 2 for healing, your next turn only allows 6 dice to be rolled. Snakes do nothing immediately, but are placed on the current Battle Board to be used by Loki later. Each character also has a special ability – the ability to heal, or add dice to someone’s pool, or prevent damage, and a few others. These powers can be activated by spending 1 hit point. Since each player only has 5 hit points, players must choose very carefully when to use their powers. After all players have taken their turns, Loki gets a turn. All of the Snakes rolled by the players are now Loki’s pool, and someone must roll those dice. Hammers, again, do damage. 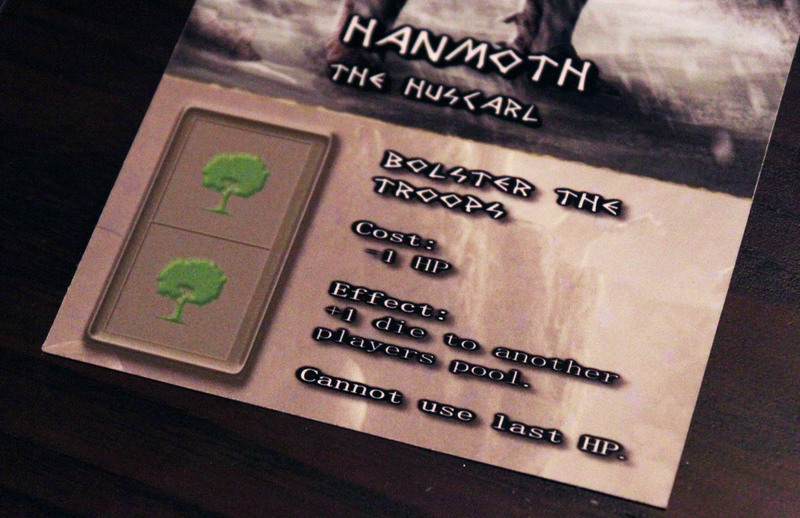 When Hammers are rolled, a card is drawn from the Loki deck to determine which player gets the hit – and this could potentially be one, none, or all of the players. Snakes rolled by Loki can activate a special, powerful attack, but only if a minimum number of snakes are rolled. 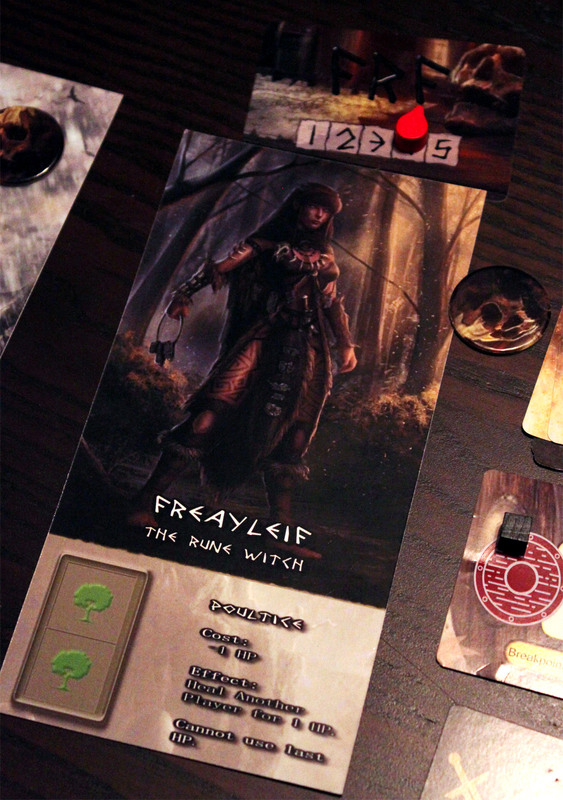 Trees can also unlock a powerful action – but this action is beneficial to the players, and again a minimum number of trees, based on the current battle board, must be rolled. Players can use armor to absorb damage. 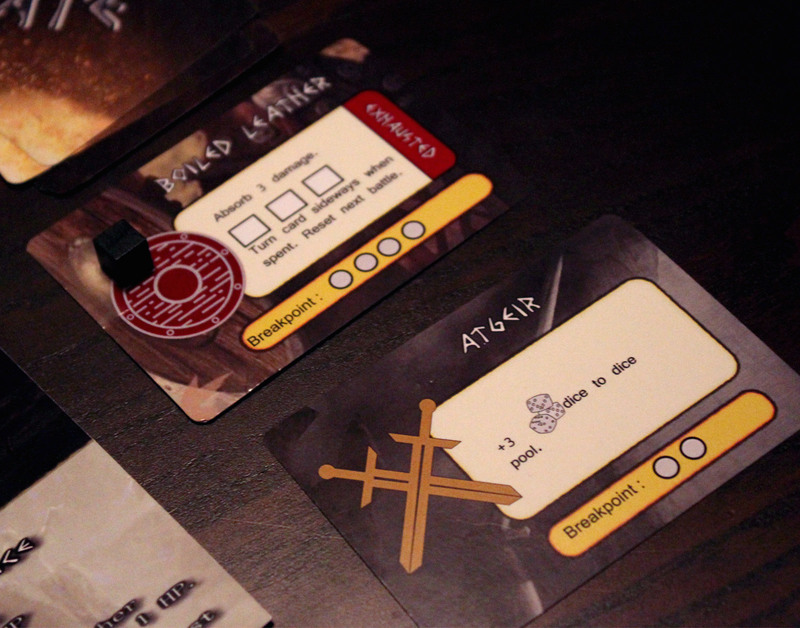 In addition, each player has 1 “death” token they can use to come back to life after being killed, and there is one community death token that can be used to bring someone back to life twice. 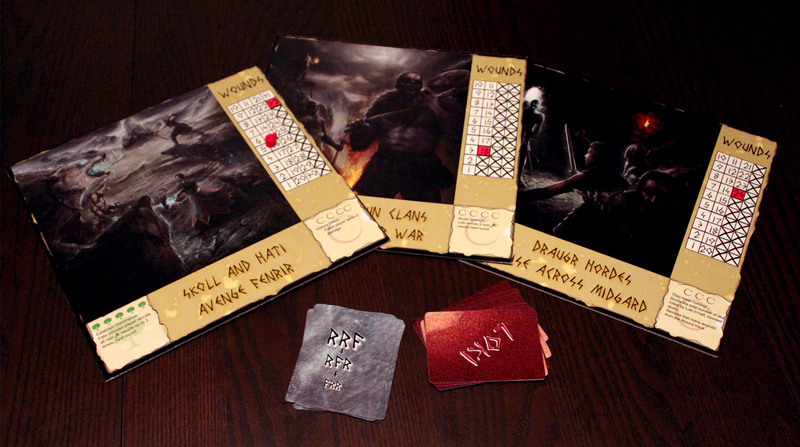 Players will roll dice until they defeat every battle board, or until they’re all dead. Of all light dice games out there, Runecast is probably one of the most thematic. While I can’t comment on component quality, since I had a prototype, I believe the art is final or at least near to it, and the images really evoke the “Viking” feel. The battle boards are nice and large to give you a clear view of the opponents you’re fighting to get a visual sense of the battle, which is cool. And, each of the characters are decked out in full Viking armor. These are serious warriors, both male and female – no campiness or trashiness here. This is definitely a lighter dice game – most of what you do involves rolling dice and figuring out the results. The primary decision space is choosing when to use your powers. Since you must spend Hit Points, it’s always a risk, and the powers are now sweeping, mighty, game-changing powers. You get a point of healing, but you spend HP to do that, so you better choose wisely and spread your health around to the people who need it. Weapons and Armor give you some options as well – each weapon has a limited use, so if you draw a good one you have to decide whether to use it up right away or draw it out to last as long as possible. This game might work very well for introducing younger players to dice-rolling games, since kids will certainly enjoy rolling fistfuls of dice. The artwork is serious but inoffensive, so they might feel like they are playing a more “adult” game, but there is nothing here that requires deep or abstract strategy. If this game caught your attention, just realize that despite the serious tone, it is heavy on the randomness – Fate is an integral theme that runs through the backbone of this game, and Fate – i.e. dice and random card draws – will do a lot of the work for you. If you want a big, strategic, or tactical Viking war game with dice, this is not it. If you want to sit down with a bunch of friends to joke around and roll some d6’s, you might just get by with Runecast. Interested? Check the game out on Kickstarter.